Douvan will aim to banish bitter memories and prove he is the ultimate comeback king when making his eagerly-awaited return to action in the Betway Queen Mother Champion Chase. 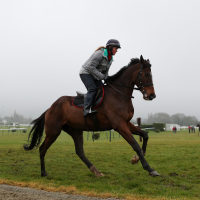 The Willie Mullins-trained seven-year-old has not been sighted since suffering a shock defeat in the two-mile showpiece 12 months ago, where it was subsequently discovered he had sustained a stress fracture to his pelvis. And i t was feared the Rich Ricci-owned gelding would be out for the current campaign after meeting with a different setback in the run-up to the Tingle Creek at Sandown in December. Mullins said: "It was very disappointing when we found he wasn't right and it looked like he was out for the season. Within a week or 10 days, he was sound when we thought he shouldn't have been so we had him re-investigated. "There was obviously something there but something he can live with, it might come up when he runs, we just don't know. "I remember the morning he got the injury, he did a bit of work and it was awesome and then the following morning he was lame. "Whether he'll get back to how he worked that day, I don't know. That was the fastest bit I'd ever seen but I told the lads I didn't want to see him do that again and to keep it for the track!" Having made a quicker-than-expected recovery from his latest problem, the eight-time Grade One winner is now on course to restore his reputation and add to his previous Cheltenham Festival victories in the 2016 Arkle and the 2015 Supreme Novices' Hurdle. Mullins' son and assistant Patrick added: "He is in great form and he did a fantastic piece of work the day of the Red Mills Chase. "It is an unenviable task as Altior is a formidable opponent to take on without a prep run. Looking back, Arctic Fire came here and won a County Hurdle without a prep run off top weight, and Quevega did it for a good few years as well. "If any horse can do it Douvan can, as this is the sort of horse every trainer wants to have and every jockey wants to ride." The Closutton handler will also be represented by Min who, like Douvan, is owned by Ricci. Mullins jnr said: "We purposely changed the tactics last time out and that seemed to help. He was beaten seven lengths by Altior in the Supreme and if the real Altior turns up, it will be hard to reverse that. He is in great form, though, and deserves to take his chance." The presence of an end-to-end gallop is expected to play to the strengths of Tingle Creek winner Politologue, according to his trainer Paul Nicholls. He said: "This horse has been an amazing horse for us this year. He started out winning the Haldon Cup, he then won the Tingle Creek then he won the Desert Orchid. "He then came up against the mighty Altior and was second. He ran very well at Newbury the other day. He will improve for the run, but I'm not sure he can beat Altior. "We have all got to live in hope, it is a different day, different track. We did end up having to make the running at Newbury, which is not ideal. He is better in a real fast-run race where he can get a tow into it and use his jumping to keep in the race." Tom George is keen to let multiple Grade One winner God's Own take his chance, despite conditions not being in his favour. He said: "He is as good as he ever was, that's what I think anyway. He gave it away last year by two catastrophic jumping mistakes. .
"He has almost got his summer coat now. We need to get a bit of match practice in and we don't really want to wait until Aintree. "He needed his last run badly and he is a horse that thrives on his racing. We have some in there that this rain will be to their advantage, but he is not one of them." Henry de Bromhead fears reigning champion Special Tiara, who will be joined in the race by stablemate Ordinary World, faces a tall order if he is to repeat last year's success in less-than-ideal conditions. He said: "He is brilliant, but it will be very hard to defend it. It was fantastic to win the race last year, but on this ground we are up against it. "I thought his run at Leopardstown was fantastic.He always wears his heart on his sleeve and he always gives his best. "He nearly beat Sire De Grugy in the Tingle Creek on soft ground at Sandown so he does have his days where he does go on it. It just depends if it is loose or tacky and that will have a lot to do with it, but that is so hard to judge."